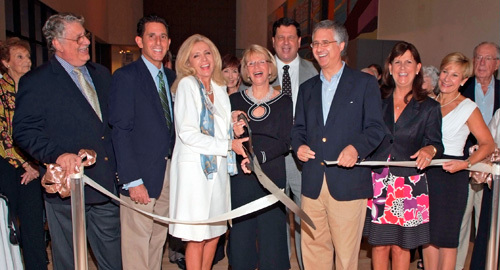 The Boca Raton Museum of Art officially re-opened its doors on Tuesday, October 12th and unveiled its newly renovated center. The re-opening coincided with the Museum’s 60th Anniversary, so the Museum marked both milestones with a Grand Opening Reception exclusively for members. This joyous event drew an enormous crowd to see the spectacular renovations and upgrades made to the building and discover four new world-class exhibitions. “The Vernissage Opening to celebrate the results of the Museum’s newly completed renovation also served to reinforce the reason for its popularity and its overwhelming community support. In attendance was an invited group of distinguished city, county and state officials who took advantage of the opportunity to applaud what the Museum’s world-class exhibition schedule and its unrivaled education outreach program have meant to the reputation of the City of Boca Raton, as well as to the cultural enrichment of South Florida,” said the museum’s executive director, George Bolge. The Mizner Park building was temporarily closed this summer to allow for extensive upgrades, repairs and painting that would enhance the appearance, appeal and entire visitor experience, as well as maximize security for the priceless art on display. Valerio Adami (October 12, 2010 to January 9, 2011) – Recognized as an important European artist whose work represents the French intellectual version of Pop art, Adami’s famous bold colors and flat forms with thick black contours evoke the appearance of cartoons. Yet his everyday imagery conveys his many social, philosophical, political and literary references. This exhibition presents a retrospective of more than four decades of work with 23 important paintings from the 1960s to his most recent paintings. Robert Cottingham, Twenty Ways To See A Star (October 12, 2010 to January 9, 2011) – Throughout the 1970s and ‘80s, the great photorealist painter of America’s signs and building facades was fascinated with the image of a star on billboard marquees and electrified commercial signs. This nostalgic exhibition debuts a series of 20 iconic star silkscreens on canvas through color variations of one of his most recognizable images.. Romanticism to Modernism, Graphic Masterpieces from Piranesi to Picasso (October 12, 2010 Through June 19, 2011) – This exhibition of fine prints includes stunning examples by acknowledged masters of the eighteenth, nineteenth and twentieth centuries, including masterworks by Giovanni Battista Piranesi, Francisco de Goya and Pablo Picasso, each of whom is celebrated for his pioneering experiments in graphic art. Latin American Art (October 12, 2010 to May 1, 2011) – Reflecting the search for cultural identity, this exhibition features twenty works by many of the most important 20th century Latin American artists ranging from the traditional figurative sculpture of Francisco Zúñiga, to the modernism of Rufino Tamayo and Matta, the contemporary abstraction of Enrique Castro-Cid and Carlos Cruz-Diez, and the poetic realism of Julio Larraz. This grand re-opening marks a new look and a new era for the Museum as it celebrates its 60th year of bringing culture to the community.